Are you ready for cuteness overload? Because these 8 little girls are almost too cute for words! Now that Shawn and I have so much outdoor space, we have been wanting to get some backyard chickens. Every single morning for breakfast I make us eggs. I think it will be so fun to be able to go outside and get fresh eggs every day. We were originally going to get just 4 chickens, which would have been plenty of eggs for the 2 of us. But my sister and her husband and my parents both said they would love to have fresh eggs too. I secretly wanted to have a big hen house, so 8 chickens it is! Now that the weather is starting to warm up, it seemed like the perfect time to start raising them. 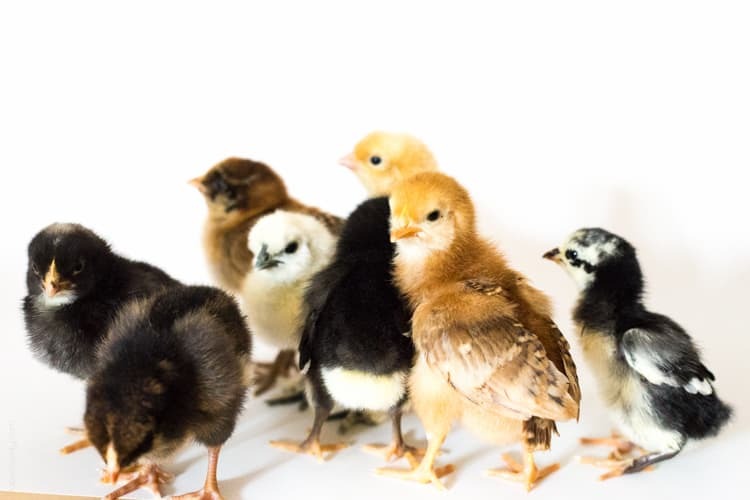 It’s best to wait until the temperatures are closer to 65 degrees all day, and the chicks have all the feathers grown in before transferring them outside. So by early June they’ll be 2 months old and able to stay warm enough. We went to our local farm supply store the Friday before Easter to pick them up. They had a lot of different breeds of baby chicks. I had done some research, and I knew I definitely wanted a Rhode Island Red and an Orpington, since many people raved about those 2 breeds. Since this is our first round of chickens, I thought it would be fun to get all different ones so they would all look different and lay different colored eggs. Before we got them, I didn’t think they would feel like a “pet”. Boy was I wrong! 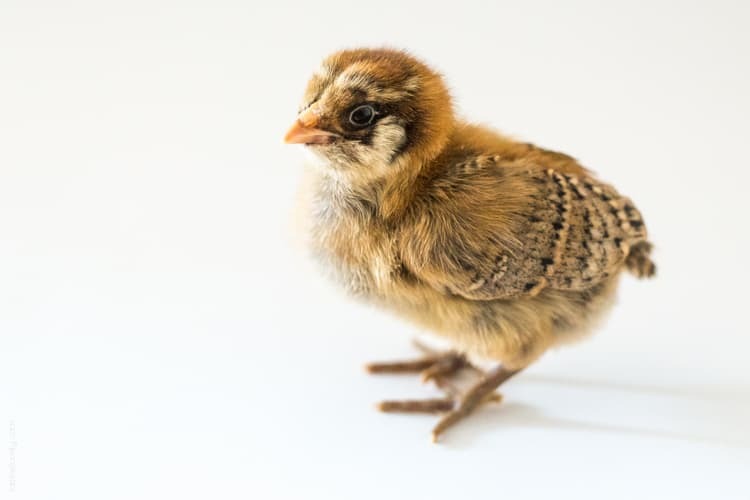 As soon as we picked them up, and they were all in that little card board box chirping away ready for the ride home, Shawn and I were like brand new parents with our newborns. He took the back roads home, and was driving so carefully. I was holding them, and kept peeking inside the box to make sure they were ok. We were both talking to them constantly, “It’s ok girls, we’re going to take you to your new home! You’re really going to like it there.” Even though it was a warm spring day, we were blasting the heat in the car and sweating just so the chicks wouldn’t feel cold. 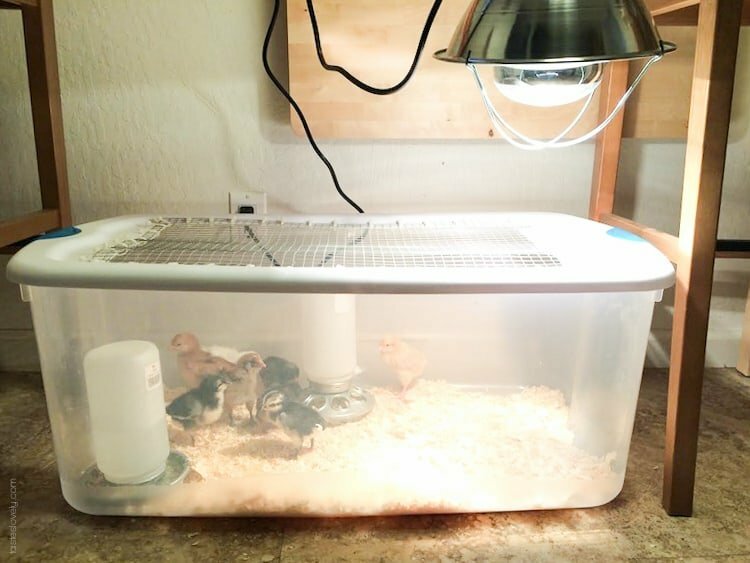 We got them home and settled them in to the brooder Shawn had made. We had a bunch of names picked out, and we sat there and picked up each one to decide which name she should get. Then, we sat there, for almost an hour, and tried to memorize each one. It was like a game of Memory. But now, I can tell them all apart so easily. Allow me to introduce you the girls! This little red one is Rosie. She is a Rhode Island Red. I think Rosie was already almost a week old when we got her. See how she already has feathers on her wings? She’s one of our “big girls”. She loves to be held and explore, and when we walk in the room she stands up really tall and stretches out her neck so she can see everything going on. This very proper looking girl is Deandra, Dee for short. When I took this picture of her, I put her down and she stood exactly like this, all tall and with good posture rather than trying to run around and explore. She is quiet, and likes to follow the rules. I’m not positive what breed she is, but as she keeps growing it will be easier to figure out. This little lady is Aria. She is the tiniest chick we had. I think she is an Oriental Aseel. Much like Aria Stark from Game of Thrones who she is named after, she is tiny but very tough. Even though she is the littlest, she is brave and gets right up to the feeder to get her food, and will play with all the bigger chicks. This big girl is Carrie. Carrie is a Golden Laced Wyandottes, and like Rosie I think she was already a week old when we got her since she already has feathers too. Carrie really likes sitting on things that are high. I am constantly finding her sitting on top of the feeder, and whenever we take the lid off the brooder she loves hopping out and balancing on the side. This is Lena. Lena always has a lot to say. When we first brought them home, if we weren’t in the kitchen with them Lena would stand there and chirp and chirp and chirp. But as soon as we would walk back in, she would relax and lay down. Now she’s gotten much more comfortable. This fluffy white lady is Meryl. She is a white silkie, and is going to grow up to be the fluffiest white puff ball with feathers all down her legs. 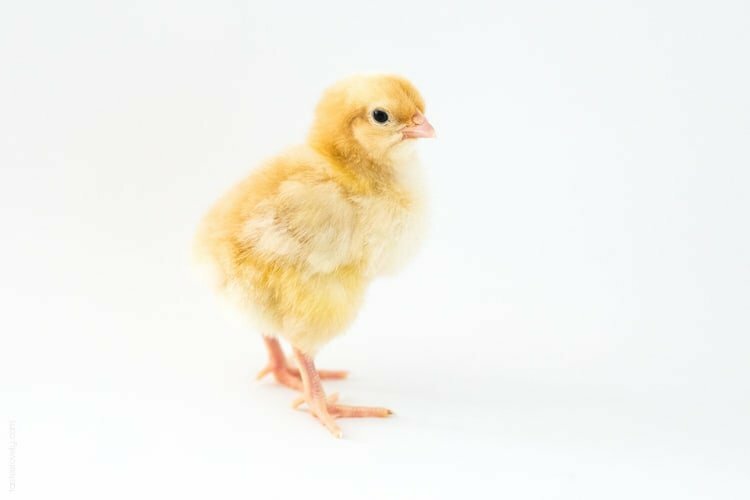 She is also a really small little chick, and when she’s full grown she will only be about half the size of the other chickens. 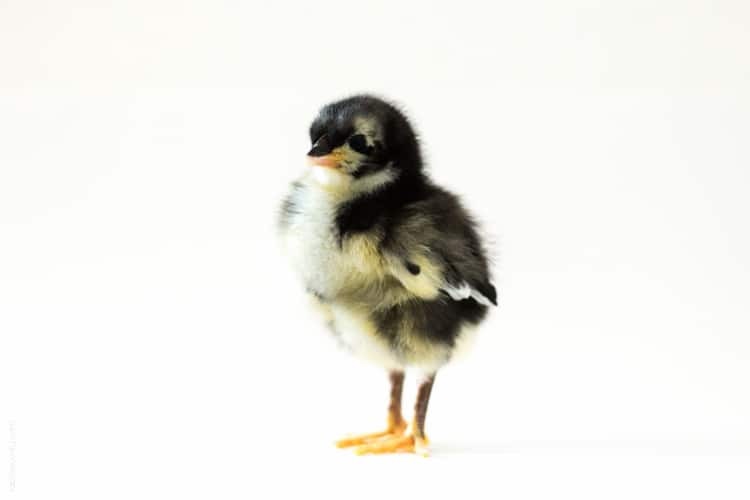 This perfect little chick is Martha. 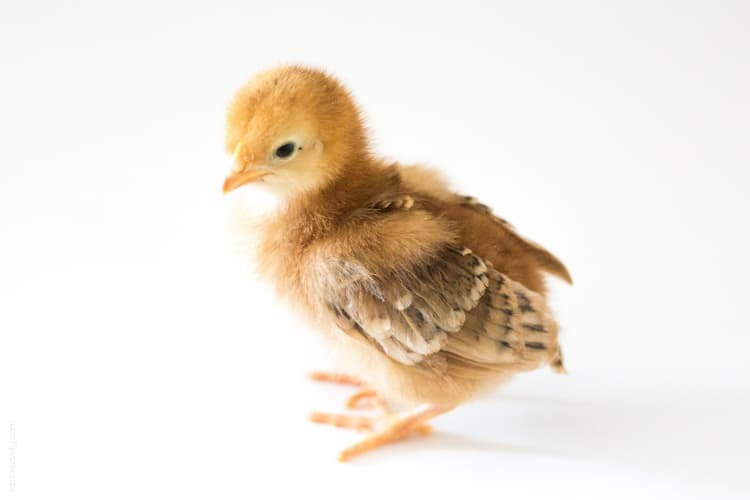 She is an Orpington, and is going to grow up to be a big golden hen. Martha is very sweet, and is also very chatty. She is always walking around and making little chirping noises. She loves being held, and crawling into the hood of my sweatshirt or making a little nest in my hair. Last but not least, meet Elaine. 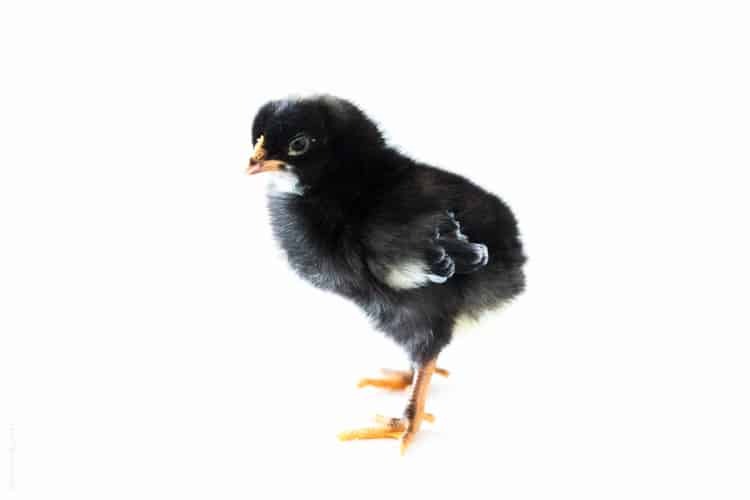 I think Elaine is a Barred Plymouth Rocks hen, and she will grow up to be black with white tips on all of her feathers. Elaine is very sweet, and loves to scratch and make a little bed for herself. This is the brooder Shawn made for them. It is the perfect size for them right now. Should be interesting once they get bigger and start to outgrow this. 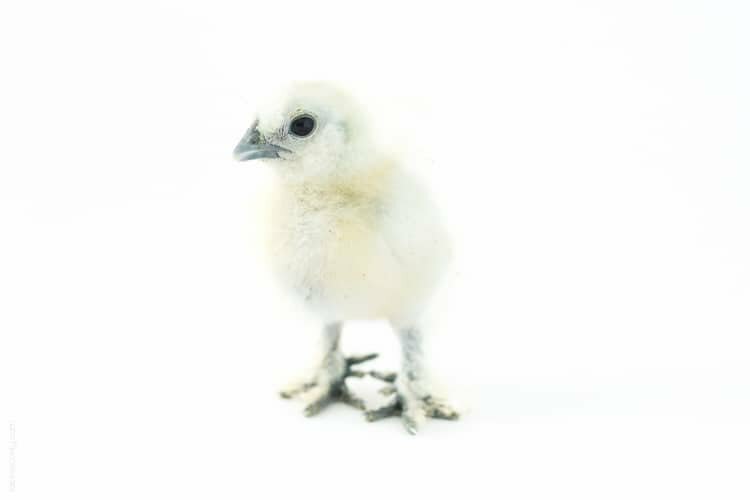 I will keep you updated on if we need to change to a bigger brooder. We have them set up in our kitchen where our table usually is. We don’t have a garage, so this was the best spot. They are so cute when they go to bed. They all get in a big chick pile and fall asleep under the warm lamp. Love how cuddly they are with each other! Shawn and I try to hold each one for about 10 minutes a day, just so they get really comfortable being around us. Day 1 and 2 they were very nervous when being held, but I can already see a big improvement in their attitudes. They are fine being held, and quickly fall asleep. They especially love burrowing in to my hair, like Rosie is doing. Or crawling in to my sweatshirt or clothes, like Martha is doing. More than anything, they like being warm. 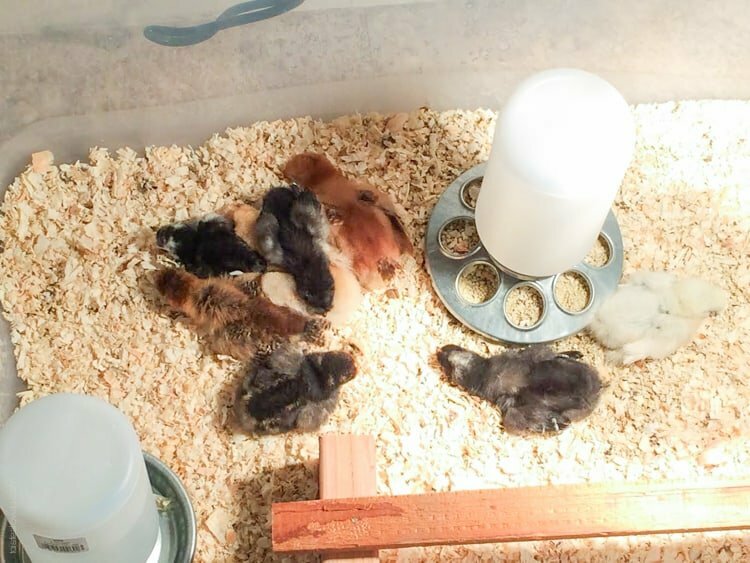 Their little fluff doesn’t do the best job of keeping them warm, which is why you need a heat lamp that keeps the brooder 95 degrees the first week you bring them home, and then you can lower the temp 5 degrees per week until they can handle room temperature. 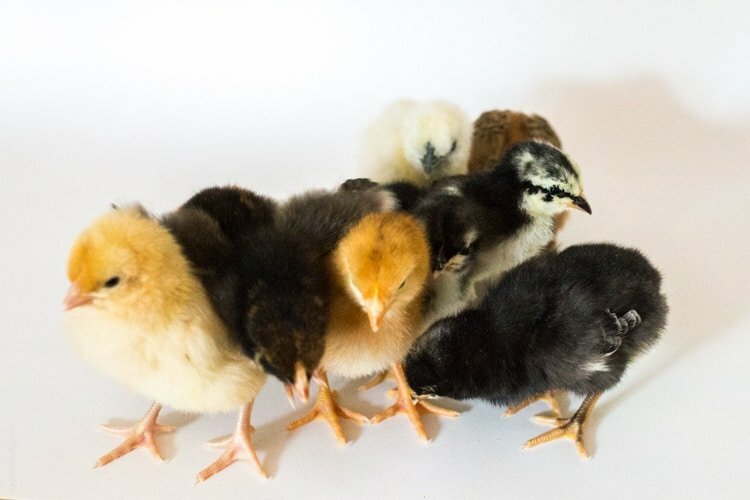 In case you are wondering, trying to get a picture of all the chicks is verrrry tricky. But Shawn found a great trick to get them all facing the right way. We called it the “chicken shuffle”. I got a cute little video of it. You can hear their little chirps, which is the new soundtrack of our house. So now you’ve met the girls! They’ve already grown up so much in the past week. I’ll be back every now and then to share some updates, pictures of them growing up and what we’ve learned while raising them. Oh my gosh Natalie, this is fantastic! I adore your precious chicken photo shoot! So darling! And the little profiles to go with each of them! I can’t wait to see what happens with this new adventure! Natalie, oh my gawd. . cute overload indeed!!! I love them!!! 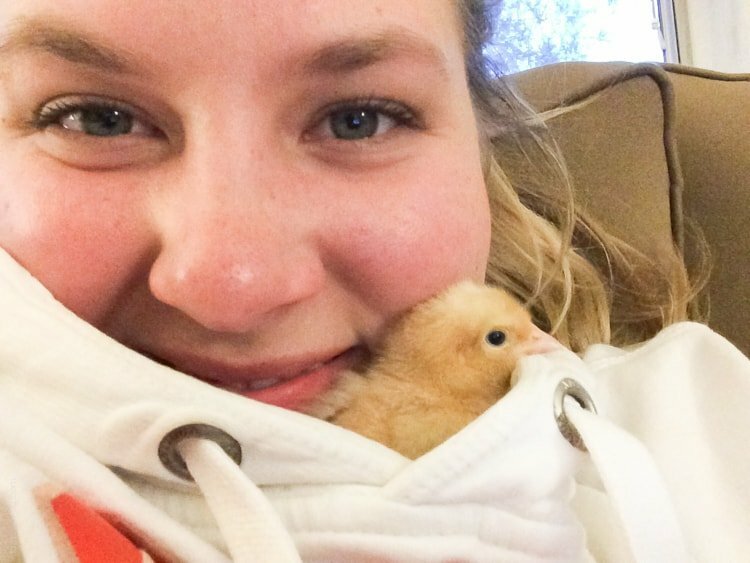 I want baby chickens!!! love them so much! Ohhh how cute! 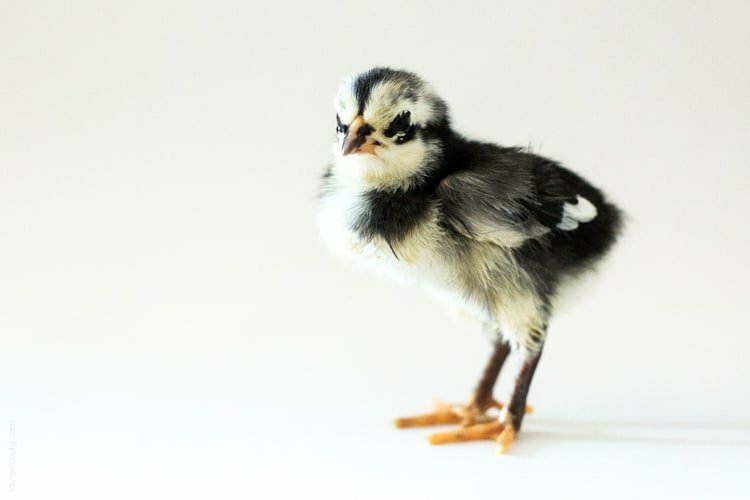 I want backyard chickens so bad – I can’t wait until we buy a house. How sweet that you photographed each one! I love how you and Shawn were talking to them – that’s exactly how I would be too! I know a few people with backyard chickens, so I’ve had plenty of fresh eggs. There is nothing better, they are so delicious! A Californian girl with chickens? I couldn’t believe my southern eyes when I read that! But thats so great that you have the space to do that. Not to mention – those babies are ADORABLE! 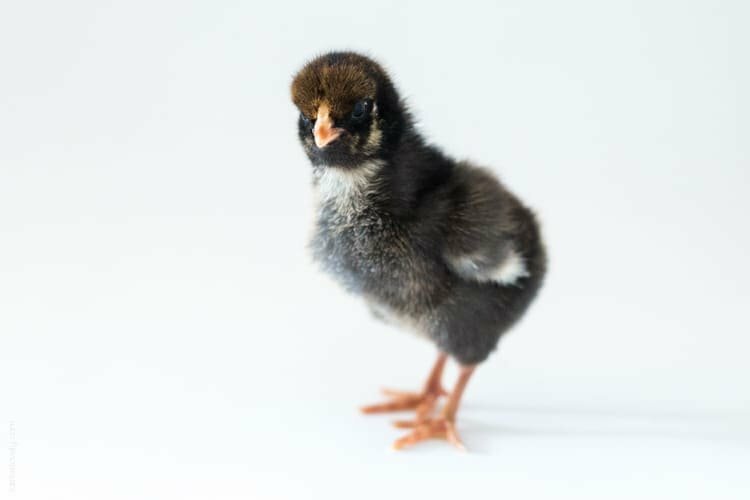 I love the chicken photo shoot you did as well… couldn’t have been easy! Love you site! Oh my gosh Natalie! They are so incredibly cute!! I just read through the post together with my husband and I think he loved it even more than I did :D We would love to have chickens! My grandma has always had around twenty hens for the last 60 years and it’s so much fun! 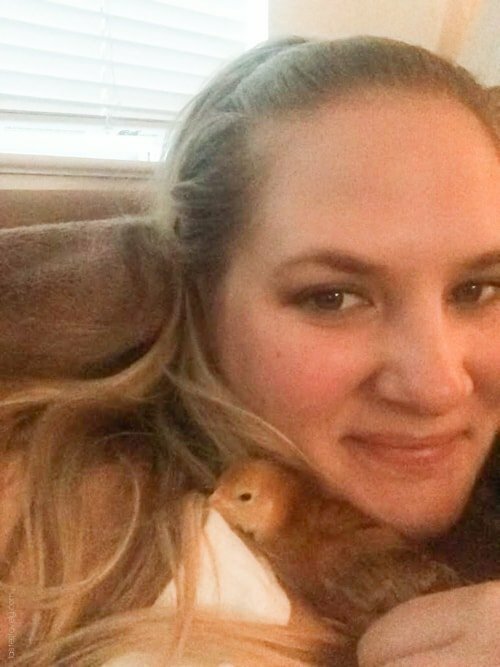 She also treats them like pets and they lay the most delicious eggs – I’m convinced it’s because of all the love they’re getting! Oh my! I think I jut passed out from all this cuteness! Adorable! They are sooooo cute! I can’t wait to follow along bc i would love to get chickens. Natalie this was the best post EVER! 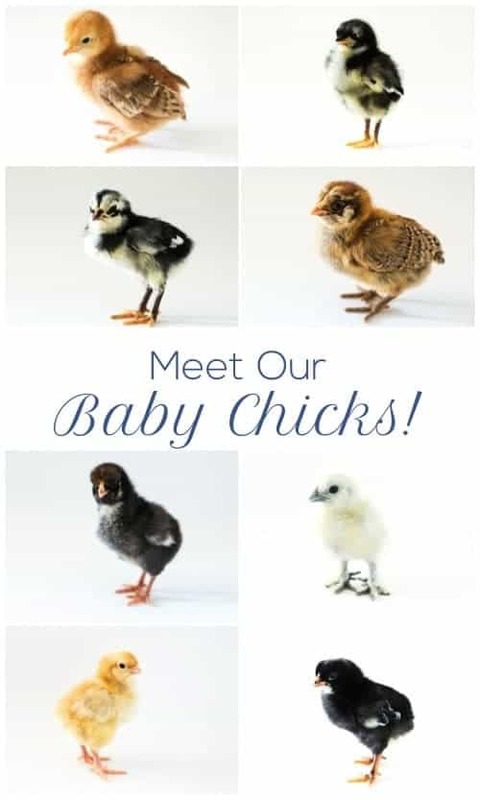 The baby chicks are absolutely adorable! I think Martha is my favorite! What little cuties!! I’m so excited for you and Shawn and your chicks. I can’t wait to follow along! 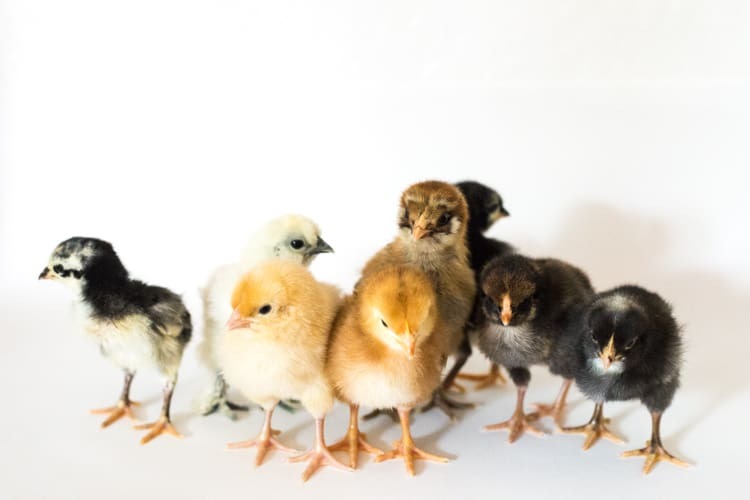 These baby chicks are so adorable! Love that you did a post on them, it will be a fun experience. Fresh eggs are the best too! Gahhhh! The CUTENESS! I just can’t stand it. 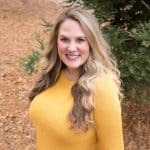 I just love this post so much, Natalie! Your little girls are so lucky to have a home like yours. They’re beyond adorable. And um, amazing photos for dealing with such squirmy subjects! LOL. Can’t wait to see more updates! OMG, I am so excited for you. 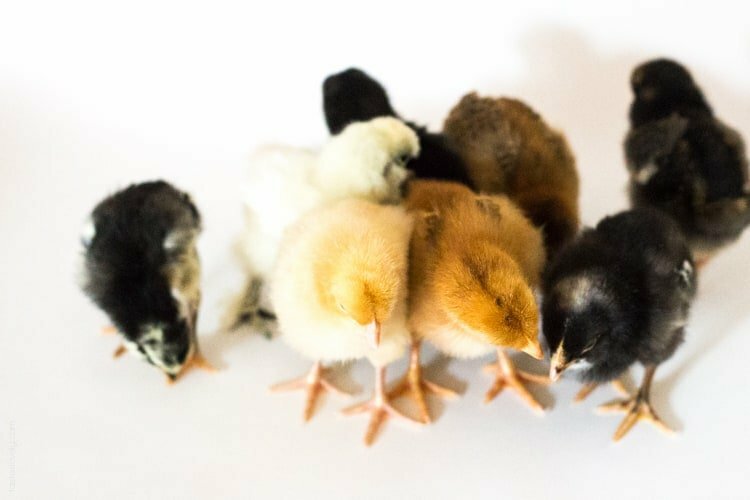 These chicks are adorable. I think Aria is my favorite :) I’ve always wanted to have a chicken but our backyard is way too small. They are so fluffy and adorable! And so many varieties! You are going to have an awesome selection of eggs everyday! Oh my gosh. Stahp it. Cuteness overload and I can’t even take it! I want them all! Oh my goodness I NEED them! We have been talking of getting chickens too, but we have a lot of work to do before that happens. So sweet! Why did this post make my eyes tear up?! I am so hormonal..Gah I want one! So cute and so nice to meet each and every one! Oh my gosh! This is the most fun blog post ever. I love it. I love all these little babies! Omg. Thanks for sharing. So happy for you and you two seem like awesome chick parents. Can’t wait for updates. I just got a chick and I love the box you made. I am stealing the idea. Our chick is hardly left alone. She loves hanging out with us. Totally a pet. Had no idea. Good luck. It’s been over a year and I love our chickens! We built them a big coop and we get about 4 eggs a day. The best!